Learning How to Get to Your Story by Sharing Your Story. We often hear about how an entrepreneur’s ‘aha moment’ led to an incredible breakthrough which launched a successful business. What we rarely hear is the backstory of what led to that moment… the mental and developmental preparation that took place which enables an ‘aha’ to happen. Long before Jen Groover built a million dollar business out of handbags, she was following a different path; she was in college to become a schoolteacher. During one winter break, Jen went home and took her first step-aerobics class. It was one of the first times she had worked out for an entire hour and she completely forgot she was exercising. It was more like a fun dance party than a boring 60-minute workout. When she got back to school, she asked the university if she could start a group fitness class. All she needed was a space to hold the class and she would provide the steps, the music, and the boom box. More than 100 people showed up to that first class. And although she had no idea what she was doing, even forgetting a microphone so no one in the back could hear over the music, she felt like she was meant to do this. As graduation approached, she no longer desired to become a schoolteacher. So when school ended, Jen decided to launch a business with some partners to become a fitness instructor. Despite the fact that she didn’t know anything about starting a business, she was passionate about exercise and felt this was the fastest way she could fulfill her desire to do something she was both highly motivated to do and make a living. She also started competing in national level fitness competitions because she loved the rush it gave her, along with feeding her competitive nature. As she was getting the business off the ground, Jen found that many companies didn’t have programs which incentivized employees to take care of their health. So she decided to create workshops within corporations that were designed to educate employees about how to make better health and lifestyle choices. In turn, this would help them lead a better life and become more successful. The more that Jen worked on her fitness coaching business, the more she discovered that her true passion was not actually in fitness, but that it was in helping people see their full potential and helping them pursue it. Her clients would always ask her how she was able to start a business right out of college. As she shared the how and why of her entrepreneurial journey, she realized that her attitude and perspective was unique, and something that people wanted to hear about. Jen began consulting with individuals as well as companies to identify their personal and professional goals, coaching them on their business and life, in addition to fitness. Before long, Jen was speaking at events and eventually became a motivational speaker at some of the same corporations where she taught fitness. Though her business was thriving, Jen’s body was not. She was pushing her physical limits by over-working and over-training with multiple daily aerobics classes, gymnastics and yoga, all while working with a number of clients. At the same time, she’d been working with an Olympic trainer to help her prepare for a U.S. National Aerobic Championship and a national anaerobic event. At only age 26, she contracted an auto-immune disease that shut down her organs. It came to a point that she was forced to drastically reduce the number of physically intensive activities and give her body a break. Everything that Jen was used to in her life had come to a halt. But the illness provided an unexpected opportunity for Jen to re-examine herself and what she wanted to do. In the weeks that followed, Jen decided to focus more of her life on mentoring, inspiring, and helping others achieve their goals. Jen attended a motivational speaker conference that featured Bob Proctor, one of the leading personal development speakers and a bestselling author. He said a number of things that deeply touched her – things that she knew, but did not know how to express or properly understand. One of the core principles Bob taught Jen centered on belief systems. She had observed over the years while working with her clients that no matter how great their product was or how much education they had, if they didn’t believe they were capable of being successful and believe in themselves, there was no way they were going to get others to believe in them. They would never reach their full potential – something she saw first hand with her clients. Inspired by Bob’s words, Jen approached him at the event and told him that what he said had changed her life. Jen committed herself to learning the intricacies and makeup of a ‘belief system’ and how it could help many of the women she had been coaching. That singular focus enabled her to help a number of her clients become extremely successful – some even creating multi-million-dollar businesses, and a few were featured on QVC with their products and brands. She started keeping her a journal capturing ideas in the hope that one day she could come up with a product of her own. As Jen continued working tirelessly to help her clients pursue their dreams and turn ideas into multi-million dollar success stories, she wondered why she couldn’t do the same. She came across an article in Fast Company about someone who pursued an idea that was similar to one she had thought of and it hit her like a ton of bricks. That person had the courage to pursue the idea and reap the rewards. Even with all those ideas written down in her journal, she was not enjoying the same successes. Here she was coaching other women to believe in themselves and teaching them how to become successful – yet she wasn’t challenging herself and living to her fullest potential. She was living in a state of fear – a fear of failure. And I said that mantra to myself over and over and over again until it became really who I was. That was the moment that set her free. Once this realization set in, she decided to figure out what she had to do change her belief system and get over the blockage. She came up with a course of action, changed her habits, chose who she spent time with, and paid close attention to everything that influenced her thoughts sharing her new found revelation with her friends and peers. Now, Jen was prepared to take action. Instead of simply writing things down in her journal, she was thinking of ways to turn those thoughts into products. That mental shift enabled her to start trusting her gut and laid the foundation for an idea that would soon change everything. When Jen became a mother of twins, she quickly encountered a number of challenges many young mothers faced. She was raising two baby girls while simultaneously managing her home, her business, and her life. 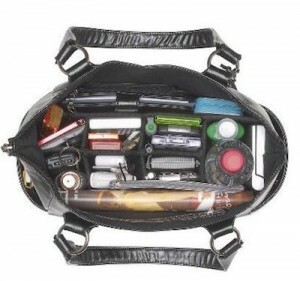 A frustrating problem Jen frequently encountered was trying to find the right bag to keep all of her things organized. She constantly dumped her handbag everywhere to look for: credit card, keys, lipgloss, etc. The items would spill all over the place, all while she was holding onto or taking care of her babies. At one particular event, that frustration overflowed into a problem that she needed to solve. Thoughts of fear and doubt crept into her mind as they did before. What solution could she make? She couldn’t draw. She wasn’t an engineer. She had never really made anything before. And what would people think if she started designing purses with no design or retail background? But Jen was determined to keep at it and listen to what her gut was telling her and believe that this was possible. Six months later, Jen was unloading her dishwasher when something grabbed her attention as she looked inside the machine. The knives, forks, and spoons were neatly organized in the silverware basket in the dishwasher. That was the ‘Aha Moment’ she had been waiting for. She immediately pulled out the silverware basket and stuck it in her handbag. Then she put all of ‘stuff’ in a neatly organized fashion into what had become – the world’s first compartmentalized handbag. The Butler Bag was born. That idea was only the beginning because Jen had no idea what to do next. She described it as a scavenger hunt to find who to help design the bag, how to get the bag manufactured, how to get people to know about the bag, etc. BUT – she did have two great things to start with– the story of a mother’s dishwasher epiphany to tell, and a utensil bin stuffed in a handbag prototype to show. She started learning all about trademarks and the patent filing process to figure out what she could patent. Then she turned her attention to figuring out how to optimize the design and manufacture the product. The industry had not innovated in years and was dominated by men. They assumed women loved their handbags the way they were and that they didn’t need to change. They did not believe there was a reason to innovate or that they should mess with a good thing. And because of that, they did not accept Jen Groover. She leaned on her support system (a small circle of friends and colleagues), her deeply routed belief in herself, and the growing support of people that heard her story – all of them encouraging her to move forward to realize her own potential and the potential of this idea. 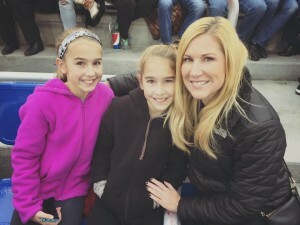 She pushed on and eventually turned her frustrating experience into a classic story of a mom-entrepreneur taking a necessity and turning it into a product and a brand. The first year of operations, Jen got her product into over 100 stores and sold $1M worth of Butler Bags. She made $10 million in her second year and went on to turn her “Aha Moment” into one of the fastest growing fashion bags in history. She became a staple brand on QVC and has since created multiple companies and has become a spokesperson for Avon, USANA Health Sciences, and Verizon. She is also a regular business and lifestyle contributor for the major TV Networks (ABC, CBS, CNBC, NBC and Fox Business News). Jen had what you might call a “wandering path” which led to her Aha Moment and the creation of the Butler Bag. She started out studying to be a teacher, then pursued fitness, migrated to life coaching, added in motivational speaking, and ended up discovering a product by staring into her dish-washing machine. Though she knew nothing about inventions, patents, design, product manufacturing or retail, she created one of the most successful (and patented) products in her industry. That long, meandering path all led to that handbag story, her “aha moment.” And Jen used that story of creating the Butler Bag to connect with people in the spirit of the American dream: the mother entrepreneur who saw a problem and created a solution which led to the creation of successful company. It has been at the center of her communication to millions of women, in her speeches, articles, and all of her businesses. Getting to an ‘aha moment’ is not one of the easiest things in the world to do, or something you can plan for. Many people spend their entire lives searching for an epiphany that never occurs. This blog is not about magically creating an “aha moment.” It’s about understanding how Jen followed her true calling, which led her down many paths, and how sharing her story was an integral part of her journey, which helped prepare her for ‘getting to the aha’. Let’s take a look as to why and how that happened. Call it intuition, call it inner voice, call it gut… as hard as Jen worked, she was in tune to her ideas and internal messages. Those ideas guided her all along the way. From her first foray into fitness coaching to the nagging frustration that there must be a better way, Jen listened and learned to hear and act on those subtle and sometimes not-so-subtle messages. They provided the direction she needed to go at each time. She allowed for the those moments of inspiration to guide her when it came to making decisions or by simply allowing an idea or thought come to her. 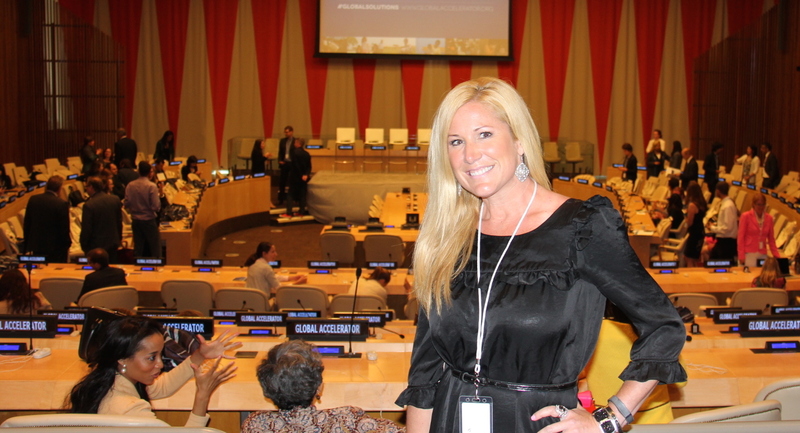 For Jen, entrepreneurship has always been a journey of self-awareness and self-transformation. In her mind, her business was an expression of who she was and who she wanted to be. At every stage of her journey, she was sharing her path, teaching people not only how to do things, but also how she got there. Whether it be fitness, self improvement or fashionable functional handbags, she communicated this to her tribe and her customers. Storytelling became an integral part of how she talked about herself and her business. 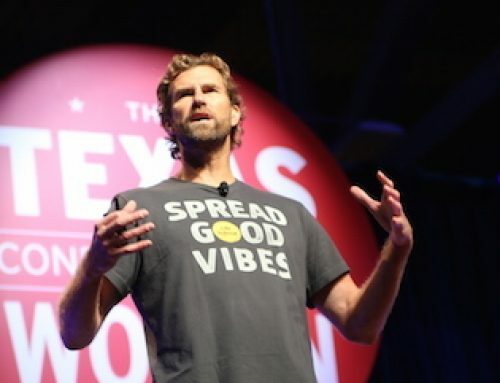 “I believe that storytelling allows for the entrepreneurs truth to come out. I believe it allows their truth to come in an entertaining way that when there’s storytelling to work on, they can project emotion. The customer can be more connected to the story and therefore the person. Truly “knowing herself” was core to this sharing. Jen constantly worked on getting very clear with what she wanted to do and being as authentically and transparent with the world. She welcomed that journey of self-transformation as that focus on enabled her to build her brand as well as create her story. When Jen Groover tells her story, it’s always personal. She takes every customer and audience she has ever spoken to along with her on her journey in a very intimate way. From her desire to make fitness fun for people instead of a chore, to helping women get rid of their limiting beliefs so they can achieve their dreams, to helping women buy great looking handbags that help them keep their life organized. Jen makes you think of the challenges she faced, the feelings she felt, and the experiences she went through as if they were your own. Jen found it was in her best interest to make her story and communication as personal as possible because that further deepened the connection with her audience. And when she finally hit upon the Butler Bag idea, she was ready to take that story to the next level. Something as simple as solving a mother’s need to stay organized became her story of the American dream. As I said earlier, getting to your “Aha Moment” is not necessarily something you can plan for or strategize on. This blog is not about that. This post is more about discussing how many successful entrepreneurs “get” to their story by learning the process of getting to know one’s self. It’s about finding your true calling, then following that calling and putting it out to the world to share. This calling may lead down many life and business paths, and by following that path, you can open yourself up to that “aha moment,” just like Jen did. You can then use that story and moment in all of your storytelling to bring yourself success. And if you are lucky, the process of preparing for and being open to this kind of mental illumination is one that any entrepreneur can benefit from because it helps you get to your story and have it grow with you. Listening. It’s a skill that all of us should actively practice because there is real power in the act of listening. Most people think this means listening to your customers or whichever audience you are sharing your story with. Those are important and can help you develop your story, but when you are first creating your story, those audiences are not yet available. And even if they are, it is hard to distinguish whether what they are saying is relevant to your story. The most accessible and critical source you should be listening to when it comes to your story is yourself. This may sound “esoteric”, but there is a world of untapped knowledge, wisdom and power locked within us. The more you listen and tap into that source, the better you will be able to craft and shape your story. This starts with listening to what your gut is telling or what direction it is guiding you in. We could go deep into this area and I could get all Eckhart Tolle on you, but you don’t have to be an expert in the metaphysical to be able to listen to your inner voice. It’s simply a matter of taking a moment to quite ones self and hear what your gut has to say. For Jen Groover, this pursuit became her foundation for all of her business endeavors. In the early stages of a company, when you have little else than an idea, everything hinges on a vital ingredient: your belief. 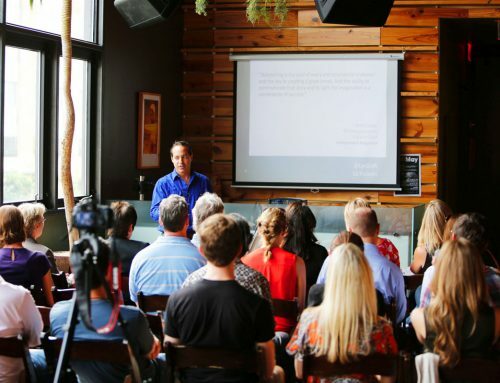 By accessing your true belief and using that in your core messaging, you will be able to translate that feeling, that emotion, that connection, so that customers will believe that you believe, and be more enticed to buy into what you’re offering. The most authentic people are the people who are most in touch with their purpose and self. Understanding what motivates you and what you’re intentions are. When you are honest about your feelings, it allows your authentic voice to be heard. Entrepreneurs often have a hard time sharing their story because they want it to be perfect or they think it’s not the right story. Or they think if they share their vision that someone is going to steal it. The reality is that everyone has ideas. It’s acting on and executing them that matters. Once you have a good, or at least decent idea or story, share it as often as possible. This sharing helps you get closer to the true story or the stories that work best. Sharing your story helps you learn how to better tell your story, clarifies and fine tunes it, gives you a platform for your story to grow with you, and helps you identify whether you have the right story or not. 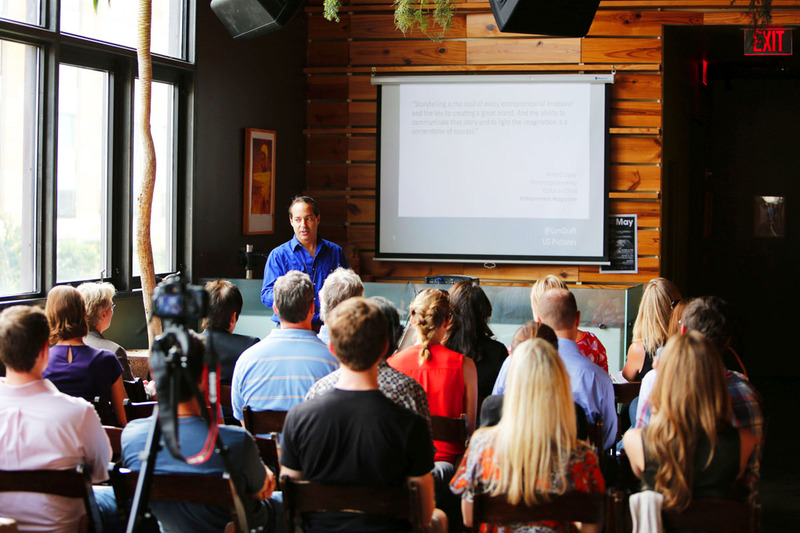 People want to see and be part of your entrepreneurial journey. Everyone loves the behind the scenes type experiences because they want to feel like they are in the ‘in’ group. Next is a much longer video (76 minutes) of Jen speaking at an SEI event, but if you want to really dive into her personally story and see how she takes along in her journey of self discovery, this is a good one to watch. Lastly, here is a TED Talk Jen did in Philly in 2015 on Leadership that you might enjoy as well. 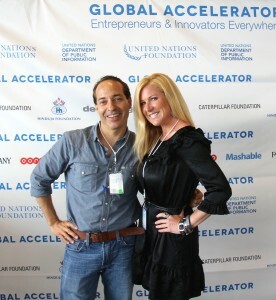 Jen and I got to meet at the United Nations Foundation Global Accelerator event for Entrepreneurs and one of the great things I love about Jen is that she is still on this journey of self discovery and continues to share it along the way. Over the last few years she has not only launched new brands, she has started focusing on helping people understand the concept and importance of emotional intelligence. What she has learned has been central to her success and something she shares openly – and in the process, inspires and empowers others to realize their greatest potential. In the coming year, I’ll be sharing part 2 of this blog that talks about what happened to Jen after only a few years of incredible success with the Butler Bag, she discovered that one of her partners had stolen from her and left her with nothing. A good story worth telling.